I’ve almost no doubt that I’m going to enjoy Batman Arkham Knight. It looks beautiful, the combat and mechanics still feel great, and it continues to nail the ‘being Batman’ thing perfectly. Having played it though I’d have liked to have spent less time in the Batmobile. My hands on saw the Dark Knight breaking into the Scarecrow-controlled Ace Chemicals Plant to rescue workers and find out more about his plans. It was clearly a very Batmobile-heavy section to demo new features but looking back nearly all of what I remember revolved around the car: jumping ramps, gun fights with drone tanks (which play a lot like something from Halo thanks to the vehicle’s hovercraft-like battle mode) and pulling open doors with a winch. Those tanks belong to the Arkham Knight who seems to have his own private army of soldiers and drones being used by the Scarecrow to secure the Chemical Plant. Tech seems to be his thing with a flowing digital readout covering his face and an electronically disguised robo-voice. He also seems to have a slightly different dynamic with the Bat. While most game villains exude hatred or anger towards Batman there’s an air of contempt to the Arkham Knight’s tone. It’s almost as if Batman disgusts him more than anything else. Overall, the Batmobile stuff does play extremely well. The controls are beautifully balanced, especially considering Rocksteady have no prior with driving games, but it is such a departure for the series that it almost feels like another game competing for your attention. In the course of the demo I felt like I did very little climbing, gliding or other more familiar bat-stuff. 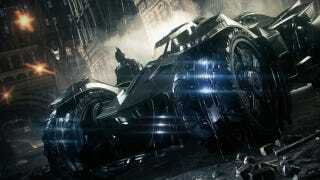 Whereas in previous games soothing city gliding sections link gameplay beats, here the Batmobile seemed to be an ubiquitous link between sections. Even some of the combat could be skipped by non-lethally gunning goons down from the driving seat. What’s going to be key for me is how often are you going to have to use the Batmobile. I like the thing: it’s an angry tank in a very fragile world but I don’t want to be overly forced to use it. Hopefully in the more open city sections you’ll have freedom to tackle things how you want rather than be corralled towards a ramp. Ultimately, despite it’s prominent placing, I want it to feel more like any of Batman’s other tools, such as explosive gel or the line launcher, rather than take a starring role. It’s always going to be tricky balancing new features, especially something as gameplay altering as a car. This was a guided demo as well with a Rockstar representative directing me through the enclosed level. Had I been free to play it unsupervised I think I would have been more likely to leave the car parked up somewhere and get on with everything in a more traditional way. Wheels aside though everything else is shaping up very nicely. After Origin’s less than crisp combat this has tightly orchestrated fights where blows quickly fall into a hypnotic rhythm. A new sword-wielding enemy presents a faster challenge and require more precise timing to take out, falling fast to beatdowns if you can clear the space to pull the move off. The altered texture they bring to fights pushes you to perfect your technique. One neat touch the Batmobile definitely adds is that you can use it in takedowns - throwing enemies in the air to be popped by whatever that non-lethal guns fires for an instant ‘kill’. Overall I’m looking forward to playing more. Partly to see how the rest of the non-Batmobile gameplay is shaping up but also to see how much Bat’s iconic wheels feature in the overall structure - the series has traditionally played out over long open sections punctuated by smaller self-contained sections. Throughout these moments, is the car going to be a useful tool or a playable character in its own right?